Your property includes many facets besides just your home. A beautiful fence is a great way to give your property a visually striking element, while also providing security and privacy. Fences come in a range of styles and materials, and the expert team at Florida State Fence has years of experience helping our customers get the perfect fence. One of the most important aspects of picking a fence is ensuring it matches the style of your home and backyard. A great fence can complete the look of your property and add a substantial amount of value. Florida State Fence has a wide selection of fencing types and styles, and we work with our customers every step of the way to craft and install the perfect fence for your property. We provide more than fencing at Florida State Fence. We help residential and commercial customers with property management solutions to make your life easier. Gate access controls: Access controls and gate operators are a great security measure for keeping your property secure. Certain fencing solutions work best with these, so contact us today for details. Decks: Your deck is another area of your property where you can show off your personality and style. We’ve been a trusted source of decks in Tampa for over 10 years, and look forward to helping you craft the perfect backyard oasis. Roll-off containers: If you need to discard waste materials during any construction project, our roll-off containers can help. Contact is for details and to hear about our affordable rates. Deciding on which type of fence you want is the first step. Wood, chain-link, and vinyl fences all have different characteristics. The primary reason for wanting a fence is a good way to determine what style is right for you. Wood: Wood fences are timeless for a reason. They come in a variety of styles and types of wood, so you get the precise look you want for your property. 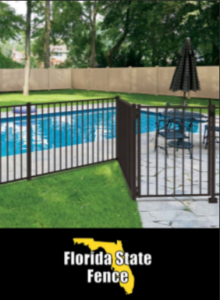 From white picket fences to sturdy stockade offerings, Florida State Fence has you covered. Our team crafts a wide array of these fences to your specific specifications. Chain-link: Another popular form is chain-link fencing. It has become one of the most affordable and efficient types, providing strong protection while retaining visibility. Many of our commercial vendors use chain-link fencing for schools, construction sites, business parks, and more. We have galvanized chain-link in addition to color-coated products. Temporary panels: Our temporary fence panels are an excellent way to protect and secure an area for an extended period of time. This solution is affordable and convenient, as our team helps install the fencing and takes it down quickly and securely whenever you need. Vinyl/PVC: Vinyl PVC fencing has become one of the most effective forms of fencing because of how low maintenance the material is. Because it can be colored or coated to match the surrounding area, vinyl fencing can be used on many different types of property. Enjoy the look of wood without any of the work with our top-rated selection. Aluminum Florida State Fence’s selection of aluminum fencing options is unmatched in Tampa. Our design and installation experience speaks for itself as our durable, long-lasting aluminum fencing is sure to get the job done right. Our ornamental options will have you securing your property in style—and unlike other materials, aluminum is rust-proof.